CHARLOTTE FARMS OPEN FOR FALL FAMILY FUN | South Charlotte Newcomers! Charlotte is considered a wonderfully entertaining metropolis and, yet, having fall fun in the country is often less than an hour away! 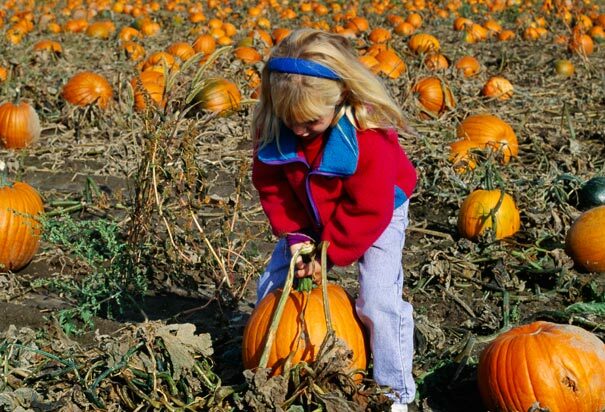 Families in the Queen City have their favorite pumpkin picking and apple picking farms and the top family choices are as consistent as Charlotte’s beautiful fall weather! Hall Family Farm is right in Mecklenburg County, up the well-traveled Providence Road. The short drive taking you past all the lovely neighborhoods on the way is almost as enjoyable the farm itself! Families can tackle a 5-acre corn maze, pick a pumpkin, take a hayride and enjoy a bonfire. Kids can enjoy the free activities including a mini maze and race. Fall hours are September 29-November 8; Monday-Sunday 9am-6pm and Friday-Saturday 9am-6pm. Carrigan Farms is just over 30 minutes from Charlotte, right outside Mooresville. This is a family owned farm with a genuine family atmosphere. Apples are still on the trees waiting to be picked and are available at the great rate of $6.50 per half-peck bag. Pumpkins are grown on the farm and families can pick them right off the vine! The pumpkin patch, tractor-drawn hayride takes the children and adults right to the pumpkins where $10 gives you the pumpkin of your choice! Hodges Family Farm is not only a great time, but is also an agritourism sight hoping to educate families about farm animals and local farming. Hayrides will take you to pick out your own pumpkin, farm animals and pony rides. There is even a Hay Mountain! After Thanksgiving, Frazier Firs from the local mountain areas are available for your very own, personally chosen Christmas tree! For every real Christmas tree harvested, two-three seedlings are planted in its place. Buying a Christmas tree supports over 100,000 people employed in the industry. The Hunter Farm provides a smaller experience, especially for those families with little ones. The farm is open to the public September 27th through November 16th. The ticket price includes a short hayride, choosing a small pumpkin and a visit to the petting barn. Bonfires and night rides are available with reservations. Located in Weddington, the Hall Family Farm is an easy, low-key adventure. Wise Acres is an organic way to pick your pumpkin and have some fun! Pick your own pumpkin and enjoy the fall colors as you travel on the hay wagon through the local woods. Explore a mini sudangrass maze and play in the playground made of 100% recycled materials. Fresh air is free and fresh ingredients are for sale. The Regal Corn Maze in Statesville is a popular fall destination for those who like a challenge! Adventures include a corn maze, corn cannon, giant slingshot, seer head lassoing and a cow train and mini maze for the smaller set! Only about an hour from Charlotte, the Corn Maze is open every weekend in October. The gates are flung open and inviting you to fall fun at Charlotte’s local farming communities! Fall colors, brisk air, pumpkins, hayrides, apples and mazes await!